A while ago a frosted sugar cookie recipe was bouncing around on the internet. I try really hard to give a recipe a shot before I modify it but I'm kind of particular about how I make my cookies. I baked them as is and then a couple more times with my modifications. This is now a tried and true, man, woman, and child approved recipe around here. These cookies are easy to make, cute, and totally happy. The frosting has a little tang from the sour cream and perfectly compliments the slightly sandy yet tender cookie texture. I added one drop of red food coloring to the frosting to make it the lightest pink. 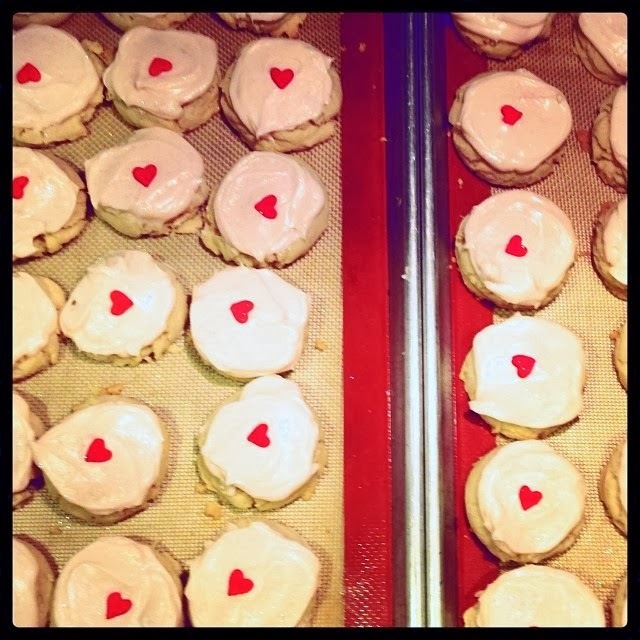 With that, a giant red heart sprinkle from the local cake store, and some edible glitter, these were the cutest little valentines cookies- without the painstaking piping that I love but can't work up the will to do most days. I served these to a crowd of men and not one of them whined about the color (and most clamored for more). These would be so easy to modify- add some extracts to the cookies or frosting to change up the flavors. I might have to make a green minty version for St. Patrick's Day! Cream together the butter, oil, and sugars. Mix in milk, cream, and vanilla until smooth and incorporated. Add dry ingredients and mix gently- adding flour as needed. The texture should be soft but not too wet, just like snickerdoodle or chocolate chip cookie dough. Be careful not to overmix the cookies once the dry ingredients are added or the cookies will be tough. Scoop the cookies onto the cookie sheet with a stainless steel cookie scoop onto a Silpat or parchment lined cookie sheet. Smoosh the cookies down a little bit using a flat bottomed glass or measuring cup dipped in water then sugar (this is optional but will leave a little sugary crust on top and some cute ruffled edges). Bake at 350 for about 8 minutes until the edges barely start to brown. Don't overbake- these will get a little harder as they cool. Frost with sour cream frosting using a butter knife or offset spatula. These will keep at room temperature for a couple days, tightly covered. In a mixer with the whisk attachment, combine the butter and sour cream until light and fluffy. Add in vanilla and salt, and blend. Next, add the powdered sugar and meringue powder, cover the bowl of the mixer with a dish towel, and turn it on low until everything is combined. Then increase the speed for a minute or so until the frosting is light, fluffy, and delicious. The meringue powder will help set the frosting after it dries so it holds its shape. If the icing is to dry, add a little more sour cream or some milk. Add 1 T. Lemon or orange zest and substitute juice for the milk to make a tangy citrus frosting. Alternately, you can flavor with mint extract or almond extract. My fiance has been BEGGING for sugar cookies all week. Maybe it's because Valentines Day is approaching? He's usually more of a sour candy guy. I'll have to finally give in and whip these up for him :) Thanks for the recipe! love all the little tips. thanks for sharing.